Members of the Greater Cincinnati Native American Coalition spoke at a Fountain Square MLK prayer vigil Monday. The Greater Cincinnati Native American Coalition was a last-minute addition to the city's Martin Luther King Day Celebration. Members of the group prayed and sang in their native language Monday. They may be planning a march for later this week. A different group, American Indian Movement Chapter of Indiana & Kentucky, is holding a peace vigil Tuesday at 10:00 a.m outside the Diocese of Covington. After a frigid Fountain Square prayer service, the Coalition's Jheri Neri said the group is staying fluid in its response to the evolving story of Covington Catholic students and a viral video that shows them standing near a Native American in Washington D.C. Spokesman for the Greater Cincinnati Native American Coalition Jheri Neri says it's tragic that the story unfolded in the way that it did. He says there were a lot of systematic failures. "We want to blame our children but it's not our children's fault. It's the community's fault," he says. "And when the culture completely breaks down we don't see it when we are doing it." According to Neri, "It's unfortunate that people have made this into an 'us versus them' and into a political event. It has nothing to do with politics." This will be a peaceful vigil to confront racism. We have seen the entire hour and forty-six minute video and stand by Nathan Phillips. While this longer video gives better context to the situation, it still does not absolve those boys of their behavior. Nathan Phillips is a respected elder. He stepped in to what he saw was a tense situation between the Black Hebrew Israelites, who were yelling harmful things at Natives and the school group, and the school group who were becoming increasingly worked up. He stepped in because he wanted to diffuse the situation with a song, with a blessing. The video clearly shows him stepping in between the two groups, but he does not force his way into the school group nor does he put himself in anyone’s face, as people have claimed. In the video you can see the boys approaching and surrounding him after he stops moving and that one boy steps up to face him, not the other way around. Their behavior at this point is still a problem, even if they did not create the initial situation. They are seen mocking, laughing at, and disrespecting Nathan Phillips. There are other videos from DC that same day showing these boys yelling “MAGA” and “build the wall” at random passer-bys near the Lincoln Memorial. There is a video of a student telling Native people that “land gets stolen, it’s how the world works.” These behaviors are still unacceptable. 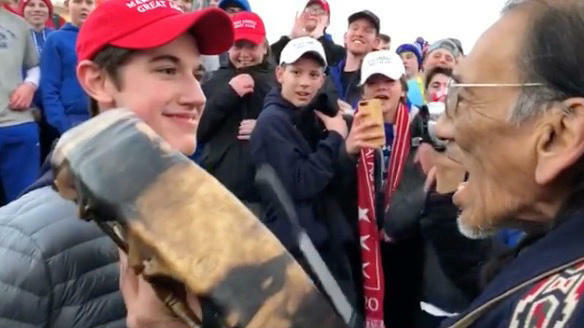 The Evolving Story of Covington Catholic's Trip to Washington D.C.
Video of students at Covington Catholic High School went viral this weekend. They were in Washington D. C. for the March for Life. While there, they had an interaction with a Native American man participating in the march near the Lincoln Memorial. The story of what exactly happened has been evolving all weekend. WVXU News Director Maryanne Zeleznik talked with new Cincinanti Edition Host, Michael Monks, who is also the editor of River City News,cabout what happened. More Details And A Longer Video Emerge In CovCath Incident In D.C.
Students from a northern Kentucky high school are under fire after video of an interaction with an indigenous person near the Lincoln Memorial in Washington, D.C., Friday went viral on social media. It shows an older man singing and playing a drum as a young man stares at him.